Magnesium is crucial to muscle contraction, nerve transmission, energy production, nutrient metabolism, blood coagulation and bone and cell formation. Magnesium is an essential mineral required by every organ in the body for a range of activities including bone, protein and fatty acid formation. Magnesium is crucial for energy metabolism by the activation of enzymes known as ATPases, which are needed to generate ATP (adenosine triphosphate). When ATP is broken down, energy is released for all muscle contractions, and when exercising strenuously, ATP needs to be synthesised quickly. A shortfall of magnesium can limit energy production, leading to fatigue, lethargy, muscle twitches or cramps. In order to fall asleep and stay asleep, your body and brain need to relax. On a chemical level, magnesium aids this process by activating the parasympathetic nervous system, the system responsible for getting you calm and relaxed. Nature’s Help Magnesium oil, Sleep & Recovery is certified organically harvested from Australian Salt Lakes and Oceans. Each batch of our magnesium goes through a full chemical analysis to ensure our product is of the highest standard and has the highest concentration of magnesium chloride. In fact our magnesium content is as high as 30%, which is the highest concentration possible before the magnesium starts to fall out as a solid. We do not reconstitute magnesium flakes by adding water. Nor do we dilute our product with water. One Teaspoon or 5ml of Nature’s Help Magnesium oil delivers approximately 1950mg of magnesium chloride or 497mg of elemental magnesium onto the skin. 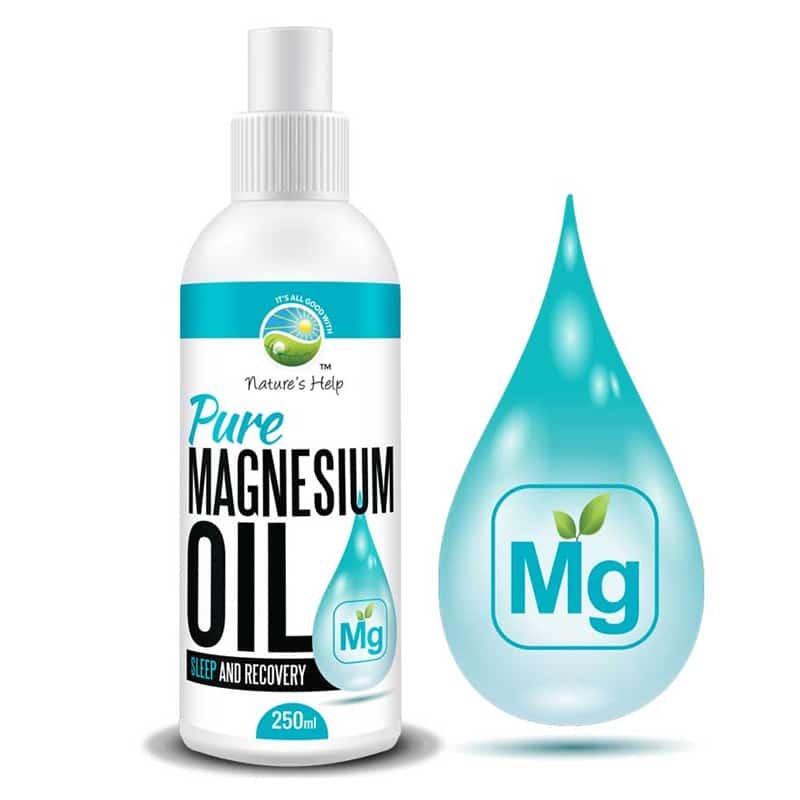 Nature’s Help Magnesium oil is created in Australia in accordance with good manufacturing practice,(GMP) under a quality system that complies with ISO 9001. It is organically harvested and is licensed as a Product of Australia. Magnesium oil: even though it has an oily texture is not actually an oil. Magnesium oil is actually magnesium chloride and is considered by many as a powerful medicinal mineral. What oil does for an engine, magnesium oil will do for your body. Magnesium plays a critical role in supporting literally everything in your body, from healthy muscles to a healthy immune system, healthy bones and much more. An abundant element on our planet, magnesium is also present in every organ in the human body. In fact, it is considered a vital mineral for over 300 biochemical reactions in our body, that regulate our health and wellness. Sadly, many of us simply don’t get enough magnesium in our bodies to the point that we unknowingly suffer from a magnesium deficiency. 100% pure, organically sourced Magnesium Chloride harvested from Australian Salt Lakes and Oceans. Directions: Spray 4-5 times onto warm skin and massage in one to two times daily. Alternatively, you can spray 10 times in a bowl of warm water and soak feet for 20-30 mins once a day. Caution: For external use only. Avoid contact with eyes. If irritation, redness discomfort occurs, rinse off skin and discontinue use.